Who would have thought that Cristiano Ronaldo, this year’s shoo-in for the Ballon d’Or award, derived all its footballing power from… an undershirt. At least, that’s what the good folks at Nike Pro would have you believe. Case in point: when Manchester United’s Kit Man (Albert Morgan) dons C-Ron’s shirt, he becomes invincible. Like, hit-the-crossbar-four-times-in-a-row-type invicible (only here, the CGI work is all too evident). According to Nike’s marketing department, the ad features the “new Nike Pro Ultimate base-layer top which is worn by players across the Barclays Premier League under their match-day shirt, to give them a mental and physical advantage over the opposition”. Rarely, if ever, does Manchester United’s kit manager Albert Morgan leave the team dressing room. While the team is out on the pitch, he’s always behind the scenes preparing equipment. But after a particularly inspiring victory, Albie decides to borrow Ronaldo’s Nike PRO shirt and hit the pitch. When he does, the aging kit manager shows off moves that would make even Ronaldo jealous. Full HD video over at Nikefootball.com. This entry was posted on Thursday, November 20th, 2008 at 4:01 pm	and is filed under Ads & TV, English Premiership, Player Profiles. You can follow any responses to this entry through the RSS 2.0 feed. Both comments and pings are currently closed. 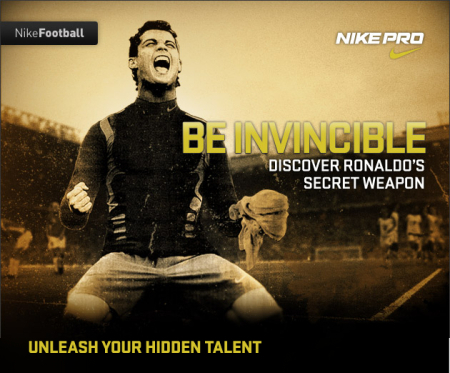 I love this ad, it’s absolutely brilliant, especially like the way Nike is taking credit for Cristiano’s skills. Great marketing, and good combo of wit and humor.